Crash & Burn - Take a Hike! This past weekend, we headed out to the mountains of Nantahala National Forest for a weekend of waterfalls. Sandy and I left after work on Friday, making it to Brevard around sunset. We continued west on US-64 to Lake Toxaway and then took NC-281 north to Rock Bridge Road. It was interesting driving on this gravel road in the dark, but fortunately there was no other traffic. In about 2 miles, we went right on FSR 4662 and followed to the end. A few from our group were already here at the nice campsites along Flat Creek. We set up our tent and socialized around the campfire for a little while before going to bed. In the morning, we started getting ready for our hike. Some people were rappelling and I was going to try to fly the drone to get a video of the descent. The drone case was too big to fit in my backpack, so I had to strap it to the outside, which was a little awkward to carry. After everybody was ready, we crossed Flat Creek to the primitive campsite on the other side of the creek and followed the path towards the waterfall. The trail is a bit overgrown, which made the hike much more difficult carrying a drone on my back. After about a mile or so, we came to the old road and went right. Sandy volunteered to carry the drone for a while. We went about a mile and turned left on a faint path that led to the top of Flat Creek Falls. Here Casey and Mike set up the ropes for those who were going to rappel to the base. Those that weren’t rappelling headed to the base via hiking. We went back to the old logging road and continued a short ways to right about where the trail leaves National Forest property. From here, we followed a faint path to the right for a few hundred feet and then got off the trail and bushwhacked down to Flat Creek. There was absolutely no trail and it was incredibly steep. Especially carrying the drone, it was slow-going and difficult. 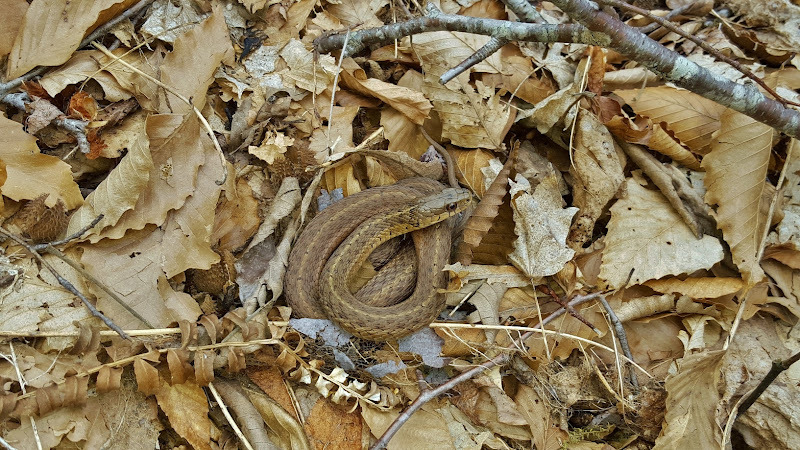 We did spot a little garter snake at one point, well camouflaged against the dead leaves. Eventually, we made it down to a path that follows Flat Creek upstream to the waterfall. We had one wet crossing of Flat Creek and came out at the base of this spectacular waterfall. This is probably my favorite one in North Carolina and that’s saying a lot. After a couple pictures, I got the drone out and ready to fly. Almost immediately after taking off, a gust of wind blew the drone into a tree and it crashed! Fortunately, it wasn’t very high up and landed on dry ground. One of the propellers broke, but other than that, no serious damage from the crash. It could have been a lot worse. But I was disappointed not to get any aerial video of the waterfall and rappelling. And carrying that heavy drone all this way was for nothing! I got a couple more pictures and then Sandy and I packed up the drone and decided to start heading back. The bushwhack straight up the mountain was brutal and took nearly an hour. When we got to the top, Sandy was kind enough to carry the drone for a ways. At the turn to get off the logging road, I took it back and carried it the rest of the way back to camp. We were the first ones back to camp, so we ate dinner and then built the bonfire. The rest of our group started arriving after dark. Everyone made it out safely with only a few minor injuries. I was so tired after carrying the drone, I fell asleep shortly after everyone got back. Sunday morning, it was lightly raining when we woke up. Sandy and I quickly packed up all our gear and ate breakfast in the car to stay dry. The others from our group were going into Brevard for breakfast, but we had already eaten, so we decided to go get one more waterfall before leaving the area - Nellie's Falls, also called Hidden Falls, a relatively unknown waterfall on Flat Creek upstream from where we had camped. We waded across Flat Creek and turned left almost immediately on an old logging road that headed gradually up. This turn was before the big campsite on the way to Flat Creek Falls. In about a half-mile, we turned left and followed the path closest to the creek. There was another path that led down to the creek and crossed, but we continued straight. At one point, a huge tree had fallen over the path and we had to bushwhack to get around, though it was not too difficult. Finally after about a mile, the trail mostly ended and we saw some marking tape indicating a path heading down to the creek towards the base of the waterfall. There was a small cascade we couldn’t really see from this side of the creek and the main waterfall was just upstream. We waded across the creek just below this cascade and then headed around a big rock to the base of Nellie’s Falls. It was bigger than I expected and quite scenic. I got some pictures from different angles and then we started heading back. Two more creek crossings on Flat Creek and we were back to the car. Everyone else had departed by this time - ours was the only car left. From here, we got back on paved roads. We took NC-281 to US-64 and drove into Brevard and met everybody at the Hub, a new outdoors store near the entrance to Pisgah Forest. We hung out with our friends for a while and then started heading back home. Sandy and I stopped at Las Salsas in Morganton for a big fajita dinner on the way.